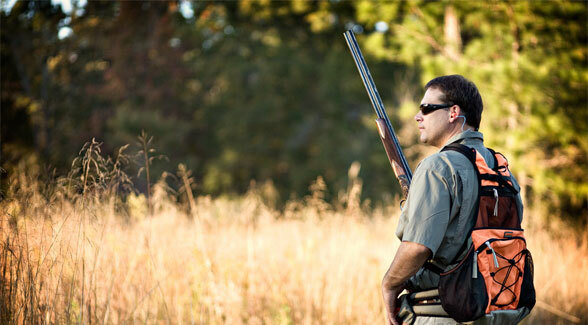 Growing up in the 1970s, Heath Shuler saw quail hunting disappear from the mountains of his native North Carolina. “It occurred to me early on that if I wanted to hunt quail, I might have to buy property with good habitat,” he says. Nowadays, that’s no small feat, especially in the Southeast where bobwhite populations have been declining for the past half-century due to changing land use. But Heath Shuler has never been a man of modest goals. 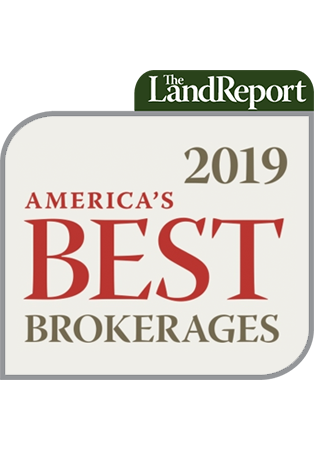 After a record-setting career as quarterback at the University of Tennessee, a second-place finish in 1993 Heisman Trophy voting, and several years in the NFL, he founded Heath Shuler Realty and grew it into one of the largest independent real estate firms in the South. Naturally, he kept an eye out for the best hunting and fishing properties. But it was his career as a football star that led him to his dream property. 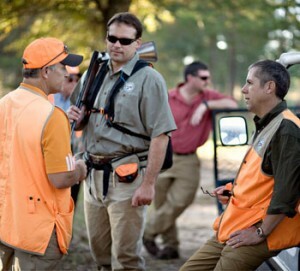 Several years ago, at the annual Quail Unlimited Celebrity Quail Hunt, Rocky Evans, the organization’s longtime president, told him about a prime quail plantation in South Georgia. In 2003, with the money from the sale of a Knoxville property, he bought a stake in Wynfield Plantation (www.wynfieldplantation.com) in the storied quail country near Albany. One of only 24 Orvis Endorsed Wingshooting lodges, Wynfield was named the plantation Wingshooting Lodge of the Year in 2005. October through March, Wynfield welcomes quail hunters, their families, and hunting dogs to some of the South’s best quail hunting, sporting clays, dining, and accommodations. Now imagine the scene: A classy brace of English setters, high on both ends, locked up tight on a covey of bobwhites amid the pines and knee-high sedge. A pair of hunters approach, one with a Labrador retriever at heel. They position themselves for clear shots, and the dog handler sends his Lab in for the flush. The birds whir out the grass, boring away toward the nearest escape cover, trying to put trees between themselves and the hunters. All the while, the setters remain steady. The guns thump four times; four birds fall. Having stopped at the flush, the Lab marks two of the downed birds. On command, she fetches them both, sitting to deliver. With the “dead bird!” command, the setters snort up the other two birds and bring them to hand before being cast in search of another covey. A passage from a Nash Buckingham story? Actually, similar scenes play out nearly every fall and winter day at Wynfield Plantation. Heath is serious about his dogs and shooting. Later, when he wasn’t playing football or closing real estate deals, Heath worked his Labs at the highest levels of amateur field trail competition and field testing. Several of his dogs achieved Master Hunter level in the American Kennel Club testing program. In 2006, Heath’s schedule went from full to packed when he defeated an eight-term incumbent Republican to win a seat in the U.S. House of Representatives. He was reelected by a landslide in 2008. He’s a member of the Blue Dog Coalition, a caucus of moderate and conservative House Democrats. His district covers most of his home region in the mountains of Western North Carolina. As Chairman of the House Subcommittee on Rural Development, Entrepreneurship, and Trade, he sponsored and shepherded into law the Small Energy Efficient Business Act, which stimulates growth in alternative energy markets by increasing investment in small producers. True to his conservationist sensibilities, he sponsored legislation aimed at developing biomass and carbon trading markets for private forest owners, and he continues to work closely with the Environmental Protection Agency on the assessment and cleanup of a large, contaminated former electronics manufacturing site that threatens water supplies in his home district. He takes stewardship and roots very seriously. In 2007, realizing that he simply didn’t have time to be involved in the plantation’s day-to-day business, Heath hired his longtime friend Mike Osteen, a veteran professional dog trainer, as general manager and head trainer. At Wynfield Plantation, Mike and two other trainers work a kennel of English pointers, English Setters, German shorthaired pointers, English cocker spaniels, springer spaniels, Brittanies, and Labrador retrievers. The staff also takes on a limited number of outside dogs for training. Most years, the Wynfield kennel produces several litters of puppies out of championship bloodlines. A few of these pups are chosen to replenish the kennel. The rest are offered for sale. Mike considers, Labs, English setters, and English cockers kennel specialties. Wynfield is a member of the Orvis-Endorsed Breeding and Training program. 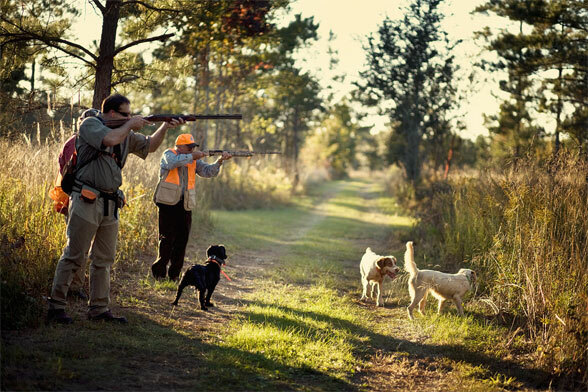 Wynfield shooting dogs learn their trade in some of the best quail habitat in the Deep South – nearly 1,900 acres of open longleaf pine uplands and classic Southern bottomland with Spanish moss-draped live oaks. The staff controls encroaching brush and stimulates growth of forbs and legumes through prescribed burning, which mimics the natural, cleansing fires that maintained the open, grassy longleaf ecosystem prior to settlement. Heath and his guests do most of their hunting on foot, so Wynfield pointing dogs are bred and trained to hunt at medium range: 100 to 200 yards. However, Mike Osteen says that the dogs range as wide or as close as they need to. Mature dogs are steady to wing and shot, and spaniels and retrievers generally stay at heel until sent to flush or retrieve, although they’ll quarter within shotgun range when the situation calls for it. “I love it when we have multiple birds down so that we can let the Labs and cockers practice blind retrieves,” Heath says. They’ll pick up the ones they mark, and then we’ll handle them to the others. You read right. English cocker spaniels running blind retrieves: taking lines, sitting at the whistle, and responding to hand signals. Sure, you’d expect that from a decent Lab, but a cocker spaniel? Clearly we’re not talking about the typical neurotic, bug-eyed, coiffed American cocker or even the average working English cocker. This is high-end spaniel work. That same attitude extends to gunning as well. Wynfield gunsmiths and gun fitters custom build shotguns to individual specification or modify guests’ guns for better fit. Rental guns are also available for guests who chose not to bring a gun. “For Heath, the dog training and hunting really serve as an escape from the pressures of Washington and the demands of his business, and gives him a chance to spend time with his family,” Mike says. “I’ve known Heath for a long time, and he’s more mesmerized by this place than by anything else he’s experienced. Considering Heath Shuler’s experiences so far, that’s saying something.